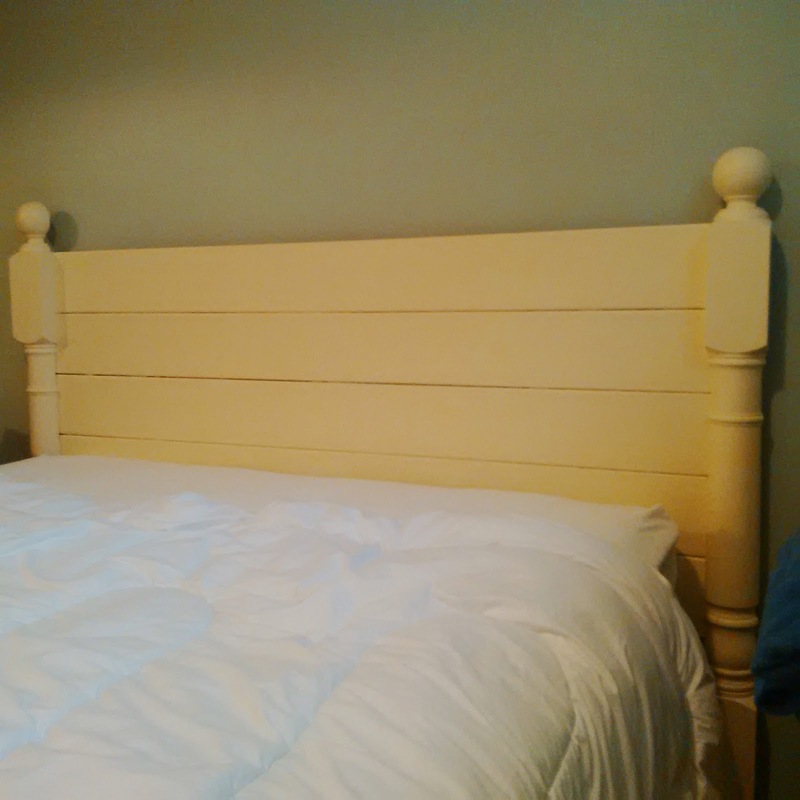 Life Freedom Family: The Easiest DIY Headboard. For real. A room makeover is underway in our house. A basement room/storage space is being converted into a guest bedroom (but will also still double as storage space). It has been in the works for a few months, but we are making or redoing most of the furniture ourselves so it is taking a bit of time. (Note: Furniture paint needs to cure for 30 days). 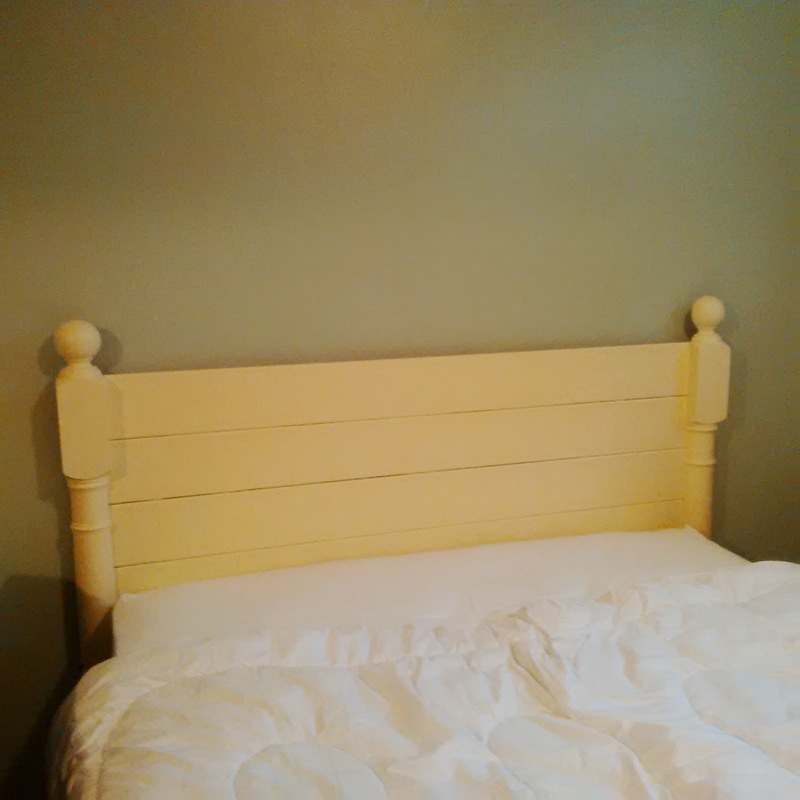 Alas, I can share this small part of things to come - the headboard. We (ie. my husband because I was busy with baby) made it ourselves. It was so easy. No sawing or cutting required!!!! -5 Cedar planks - Purchased at Home Depot for $4.00 each. -One sheet of particle board - cut to size by the find young lads at Home Depot. We have leftovers, I would estimate the portion of the particle board we used cost about $5.00. This is the genius - they will cut this to measure for you in the store. Beauty. -Para Primer - We always have this on hand. -Para Furniture Paint - It was $20.00 for the paint we used, we are also using this paint for other furniture going in the room. The colour of the paint is Lemon Verbena. Sounds delicious, non? You do not need to cut anything for this project (if it is for a double sized bed), but you do need a hammer, sandpaper, screws, and a drill. This is how easy it is: I laid out the cedar planks as desired (based on the grain and knots in the wood). My husband used finishing nails to nail them to the particle board (from behind, not from the front!). Then we placed the half pallisers (I'm pretty sure that's what their called...) onto each end and my husband screwed them in (again from behind). After this, I sanded down the pallisers but not the cedar. Then the whole thing was primed (I did three coats because it was going right onto the wood and because I knew I was using a very, very light paint colour on top). Finally, we painted it a lovely colour - Lemon Verbena by Para Paints. This colour reminds of the Lemon Tiramisu I just made. It is making me hungry. It is now in the bedroom. The entire room reveal will be at a later date.